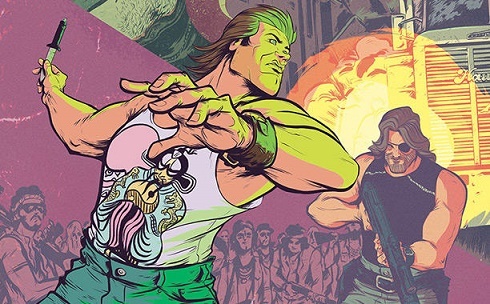 In this new original crossover concept from Boom Studios two cult-classic icons join forces, Jack Burton from Big Trouble in Little China and Snake Plissken, the renegade star of Escape in New York and Escape from LA. It’s difficult to believe that this is the first meeting of the two characters in any format. This is a crossover that many fans would doubtless instantly classify as among their most favored collaborations. Slated as a mini-series, this season is written by Greg Pak (X-Men, Eternal Warrior). A number of illustrators are on board, Daniel Bayliss, Michael Cho and Andy Belanger. The storyline of this new adventure is centred around Jake Burton finding himself being transported to the dystopian world of Escape from New York. Get ready for this awesome road trip when Snake Plissken and Jack Burton embark on a combined mission to figure out what’s happening. John Carpenter directed both movies, Big Trouble in Little China hitting movie screens in 1986 and Escape from New York in 1981. The central protagonists became among the most appreciated and recognisable 1980s cultural icons. Both Snake and Jack have figured many times in the comic adaptation treatment previously, but this edition marks the first face-to-face interaction of the characters. John Carpenter himself is apparently backing the new project. Big Trouble In Little China/Escape From New York #1 was published by Boom Studios on October 5th. There will be six other episodes in the series.